She is the quintessential association volunteer member. 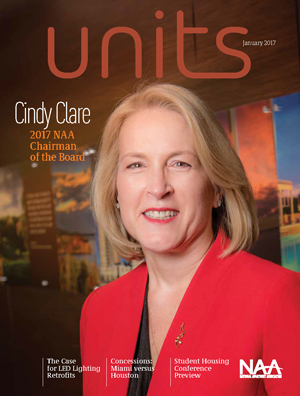 In the many years I’ve worked with Kettler’s Cindy Clare, the NAA 2017 Chairman of the Board, she has consistently shown to be a competent, compassionate and engaged leader when it comes to managing apartments or the NAA business. Clare enters this year with an exciting agenda that includes continued growth at NAA and its affiliates affiliates. She has placed a special focus on our industry’s enormous charitable efforts nationwide, calling attention to how you touch the lives of those in our communities in ways that go well beyond providing high-quality housing. She also will focus on our industry’s efforts toward diversity. I encourage you to make the effort to reach out to Clare this year. With your support, she will make 2017 a year to celebrate for our industry and NAA.